Reading Glasses ETC is a small on-line business in Northern Virginia consisting of myself, Steve Mower, and my wife Rhonda Mower. In 1986 I started working in the optical field and got licensed as an Optician (Virginia). Back in those olden times, Opticians were educated and trained to do everything related to making and fitting eyeglasses. I was fortunate in that every person I worked with was a licensed Optician. (In these modern times, retail optical stores have one Optician on site at any given time.) I guess you could consider me "old school". During the many years I was in optical retail, I managed several privately owned optical franchises in Northern Virginia. The eyewear we provided in these stores ran from the simple and affordable to ultra high-end custom eyeglasses. I was one of the first Opticians in Northern Virginia to offer and produce custom rimless eyewear. I have worked in every facet of eyeglass production from surfacing to finishing to marketing and management. 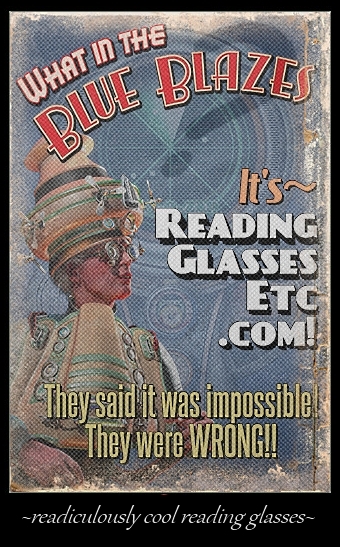 I left the optical retail industry in late 2012 to finish developing ReadingGlassesEtc.com which I started in 2010. In late 2013 I began developing a line of blue block tinted lenses. Working with experts in the optical industry, Research Scientists, Optometrists, and Lens Filter Specialists, I have created a line of tints that are designed to filter damaging blue light while allowing beneficial light through to the wearer's eyes. My goals were to create lens tints that looked nice cosmetically, were very comfortable to see through, and provided maximum UV/Blue Light/HEV protection for today's computer users. Rhonda is a Senior Human Resources Vice President currently working for Volunteers of America which is the third largest charity organization in America. Rhonda has vast and varied experience in retail, customer service, management and marketing. Rhonda has a masters degree in Science of Management. We do not have a brick and mortar store. We are a proud web-only presence. I run the day-to-day operation of ReadingGlassesEtc and Rhonda contributes her talents by helping me to select frames styles and in product development and marketing. Our Evolution We created ReadingGlassesEtc because for years my customers had been asking me for decent, stylish, and affordable, non prescription readers. We wanted to offer people better options for their reading needs. Everyone that wears readers knows that there are great dime-a-dozen, bag-o-readers available at their local big borg store. We do not sell junk readers. We started by sourcing the best quality eyeglass frames and lenses we could find. We have grown our frame selection to hundreds of unique styles, many of which are under $50.00. We now out-do our competition by offering better lenses (thin, aspheric polycarbonate) as opposed to cheap plastic, and offering blue block solutions like Mojo BluBlock AR and tints. We offer affordable and innovative reading solutions for today's reader, addressing the CVS and blue light issues with computer screens and tablets as well as offering lens options you won't find elsewhere like low reading powers and different powers in each eye. Our goals are to develop the best reading solutions for the 21st century and to provide our customers with the absolute best value, service, and online shopping experience. As a small company we like to support other small and privately owned businesses like our frame and lens suppliers and even advertising. We have grown tired of throwing lots of money to Google and Facebook for advertising so we have stopped doing it. Learn about how you can help spread the word about our unique products and make money doing it. Support us! While you are here, check out our Fun Stuff pages! Funny top 10 lists, memes and such related to first time reading glasses wearers.